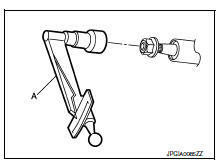 Check each part of steering column assembly for damage or other malfunctions. Replace entire steering column assembly if any parts are damaged. Measure steering column rotating torque using Tool. Replace steering column assembly if outside the specification. 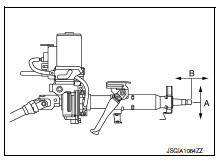 Rotating torque : Refer to ST-18, "Steering Column". Measure the length (L) as shown if vehicle has been involved in a minor collision. Replace steering column assembly if outside the specifications. Steering column length (L) : Refer to ST-18, "Steering Column". Check each part of steering column assembly for damage or other malfunctions. Replace if there are any abnormal conditions. Check the steering wheel play, neutral position steering wheel, steering wheel turning force, and front wheel turning angle.Refer to ST-5, "Inspection"
Check tilt mechanism operating range and telescopic mechanism operating range as shown. Tilt mechanism operating range (A) : Refer to ST-18, "Steering Column". 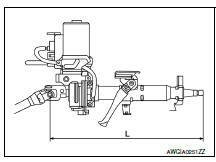 Telescopic mechanism operating range (B) : Refer to ST-18, "Steering Column".